Although we’ve yet to see a definitive move by any of the recently emerged novel flu viruses towards becoming a global public health threat, the rapid increase in the number of these viral contenders over the past three years has been remarkable. Not so very long ago we really only had one HPAI virus of genuine concern; H5N1. But as both LPAI and HPAI viruses like H9N2, H7s, H6’s, H5’s, and others have comingled in poultry operations and wild birds, and have reassorted and spread, they’ve evolved into new – sometimes highly pathogenic versions. Recently emerged viruses include H7N9, H5N8, H5N2, H5N3, H5N5, H5N6, H6N1, H10N8 . . . .
Prime among these new viral upstarts has been the H5N6 virus, which first came to prominence just one year ago, after it emerged in a Sichuan China poultry flock, and infected (fatally) one man in Nanchong City. Since then we are aware of at least 2 additional human infections (1 survived) in China, along with dozens of outbreaks in China and Vietnam. Today we have a letter appearing in the CDC’s EID Journal, which describes the more-or-less simultaneous appearance of novel H5N6 in both China and Laos in March of 2014, and describes its evolution as: `reassortants of wild duck H5N1 and H6N6 viruses, both of which have pathogenic and potential pandemic capacity in southern China’. I’ve snipped some of the more technical sections and have re-paragraphed some of it to improve readability, so many of you will want to follow the link below to read this letter in its entirety. To the Editor: Avian influenza A viruses generally do not cause disease in aquatic birds, the natural reservoir of these viruses (1). Influenza A(H5N6) was first isolated from mallards by García et al. in 1975 (2). Influenza viruses continue to evolve and reassort to generate novel, highly pathogenic viruses. Novel H5 highly pathogenic avian influenza virus subtypes, such as H5N2, H5N5, and H5N8, have been reported (3,4). Highly pathogenic influenza A viruses are endemic to many countries (http://www.oie.int/en/animal-health-in-the-world/update-on-avian-influenza/2015/), cause tremendous economic losses to the poultry industry, and represent a serious threat to public health. In March 2014, an influenza A(H5N6) outbreak caused the death of 457 birds in Laos (http://www.oie.int/wahis_2/public%5C..%5Ctemp%5Creports/en_imm_0000015052_20140507_182757.pdf). During the same month, a flock of ducks in Guangdong Province in southern China exhibited typical respiratory signs of influenza A virus infection. This flock also had 70% decreased egg production and a slightly increased mortality rate. Throat swab specimens were taken from the symptomatic and dead ducks, and the samples were used to inoculate chicken embryos for virus isolation. Hemagglutination (HA) and neuraminidase (NA) inhibition assays were performed to identify the subtype of the isolated virus, which was designated A/duck/Guangdong/GD01/2014 (H5N6) (GD01/2014). The complete RNA genome was amplified by reverse transcription PCR and cloned into the pMD-19T vector for sequencing (5). The complete genome sequence of the GD01/2014 virus was submitted to GenBank (accession nos. KJ754142–KJ754149). 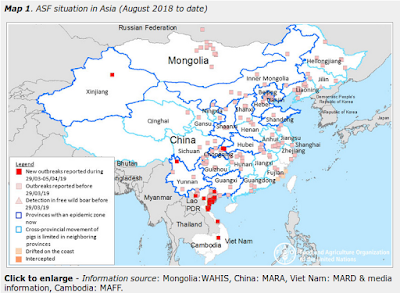 In summary, in 2014, outbreaks of H5N6 virus occurred in China, Laos, and Vietnam and caused the deaths of infected humans in Sichuan province, China (http://www.oie.int/en/animal-health-in-the-world/update-on-avian-influenza/2014/; http://www.wpro.who.int/china/mediacentre/releases/2014/20140507/en/). We characterized the novel reassortant H5N6 virus in China and found that it was the same genome type as and was highly homologous with the H5N6 virus in Laos. However, the adaptation, host range, and virulence of this reassortant H5N6 virus are still unclear and should be further investigated. Furthermore, the potential for infection, outbreaks, and pandemic in other poultry and mammals should be carefully monitored.